The armed Houthi movement flows all over Yemen and occupies news headlines in international newspapers and on TV channels as a rebellious movement that seized the power and pushed the Yemeni president and his government into exile. This movement would not have had such coverage if not for two important matters: Yemen's strategic location on the Bab al-Mandab Strait and the borders of Saudi Arabia, and its association with Iran regardless the size and quality of this association, which began intellectually in the early nineties. The armed group is based on a religious intellectual culture that based on the "Twelver" doctrine of Iran and its groups in the region. The Houthis say that their principles are derived from the Zaidi doctrine, the closest sect to the Sunnis, and Yemen has never witness a sectarian civil war, as happened in Lebanon or Iraq. The Zaidis and the Shafi'is (the Shafi'i sect) have been living without any differences and praying in the same Mosques without any sensitivity. The Houthis used both the political Hashimiyya and the Zaidi to build the group and lead the Houthi family to glory and power. It fought six wars against the regime of former president Ali Abdullah Saleh, who later joined the Houthis after the Popular Youth Revolution in 2011 in order to topple the internationally recognized legitimate government. This paper presents the tracks of the Houthi movement in Yemen from its establishment until the execution of former Yemeni president in December 2017, and its impact on the future of Yemen. In a decade, the Houthi movement was transformed from a rebel armed gang against the Yemeni government in Maran Mountains in Saada in 2004 into a political partner in the running of the state in 2014 and then into a military force that controls the state by de facto legitimacy in in September 2014. The Houthi movement has social, developmental, political and intellectual roots that made it come back to rule the Yemenis after it extended from the mountains of Saada in the north until it took control of the capital of the Republic of Yemen on September 21, 2014. By the end of the year, the Houthi revolutionary committees took over seven governorates, Saada, Hajjah, Amran, Sana'a, the capital, Dhamar and Ibb. The Houthis do not deny their main goal of reviving the Imamate / Caliphate in Yemen and see that the president / ruler of the country is not Hashemite but the Imam / Caliph should be Hashemite according to their belief. All their works are derived from the history of the Hashemite imams who ruled Yemen for a thousand years. Hussein Al-Houthi completed his bachelor degree at Sana'a University. Between 1993 and 1997, he was elected as a member of the Yemeni Parliament. Hussein Badr al-Din Al-Houthi, and his father also, refused to justify Yemeni President Ali Abdullah Saleh's war against the Socialists. But he continued to support him later in order to limit the influence of other political parties. His brother Yahya Badr al-Din al-Houthi was elected as a member of the House of Representatives in 2003 to represent the General People's Congress party (Saleh’s party). In March 2005, a series of accusations and counter-accusations between the government, Badr al-Din al-Houthi (father of Hussein) and Abdullah al-Razami, a former member of the Parliament, both belonging to the Al-Haq party, .was launched. The opposition and the Popular Forces Union were accused of preparing to resume the rebellion, while Badr al-Din al-Houthi accused former President Ali Abdullah Saleh of not being ready to end the conflict. As a result, the second round of fighting broke out with more fierce attacks on the north and west of Saada. The fighting continued for about two months. The government announced victory and the end of hostilities in May 2005, although the Houthis extended from the Maran Mountains to the north and west of Saada. The third round resulted from the continuation of skirmishes from the second round, which extended from late 2005 until early 2006. A new variant of tribalism emerged in these confrontations. Fighting began in the form of confrontations between pro-government tribesmen and tribal fighters supporting Houthi militants. () The area of confrontations extended to 25% of the total area of Saada governorate, which included many areas and districts, including (Sohar, Al-Safra, Al-Salem, Saqeen, Haidan and Majz) and other areas. Abdul-Malik al-Houthi was the most prominent field commander in this war. () Despite Saleh's visit to Washington in November of the same year, he asked for financial aid to combat al-Qaeda and did not ask for Washington's help to fight the insurgency in the north. In this war, the regional factor emerged and Iran began manipulating events by supervising the appointment of Abdul-Malik al-Houthi,() brother of the founder of the group, as a leader, which Saleh used to seek support from the Gulf without taking real measures to weaken the movement. The war in Saada calmed down after the elections until 28 January 2007 when the Houthis killed a number of soldiers in their attack on military points. The fourth round began, and the Houthis took control of most of the Saada areas. They displaced the Jews from the governorate. The war stopped in June 207 after a mediation by Qatar that brokered an agreement that was signed by the government and the Houthis in Doha in February 2008, but later the Houthis rejected to implement the agreement. Translation errorThis year the southerners escalated their discontent with Saleh’s regime and the military retirees announced the formation of a peaceful southern movement. It was only weeks before the fifth war broke out in March 2008 following accusations by the authority against the Houthis of breaking the Doha agreement when soldiers were killed in a Houthi ambush and detonated a bomb in a mosque in Saada frequented by military personnel. Translation errorSaleh was surprised that this war in this round extended to the vicinity of the capital as clashes took place in Sufyan in Amran and Bani Hushaish in Sanaa, which made Saleh use the Republican Guard for the first time, as the Republican Guard was absent from any role in previous wars. On July 17, 2008, Saleh announced an unilateral ceasefire that coincided with the 30th anniversary of his rule, but the Houthis put Sana’a before their eyes. Translation errorThe Houthis in Sa'ada carried out kidnappings of foreigners working for international health and relief organizations. This matter led to the outbreak of the sixth war on August 11, 2009. The authorities put six conditions for the cessation of operations, most notably the withdrawal of the Houthis from all sites and all the districts of Sana’a governorate, to deliver what they seized of civilian and military equipment, the disclosure of the fate of the kidnapped foreigners, and the cessation of sabotage. But the Houthis were rejecting any concessions in favor of the option of peace. Translation errorDuring this war, the Houthis attempted to divert attention from their rebellion to gain local and regional sympathy by accusing Saudi Arabia of supporting Saleh in his war against them and so they carried out an attack on the border with the Kingdom. This pushed Saudi aircrafts to intervene. The Saudi intervention restricted any movement by the Houthis despite leaking information that they obtained special weapons from the Republican Guard including RPG, night telescopes, and anti-tank guns that they used against Saudi soldiers. Translation errorIn the same year 2009, Yemen witnessed an important event that was the announcement of the establishment of al-Qaeda in the Arabian Peninsula. This year Saleh benefited greatly from the unlimited support from the West to fight terrorism. The event coincided with the political movement of the opposition to save the country where the National Consultation Meeting was held in Sana'a on 20 May to elect a committee to prepare for the National Dialogue Conference. Translation errorThe Houthis exploited the deteriorating in the country and expanded in Saada after the end of the sixth war on February 12, 2010. On January 25, 2011, hundreds of people went to the streets in Sanaa demanding changes in the government following proposals by the government to amend the Yemeni constitution to allow Saleh's son to take power. Thus, a new stage in the history of the Houthi group started. This phase was a breath of relief for the Houthis as they began to spread more in the governorates taking advantage of the democratic glare after the fall of Saleh's regime. The Houthi movement found an appropriate opportunity to cause internal wars that weaken the state and the Houthis’ opponents. After large demonstrations on February 11 demanding the departure of Saleh, the Houthis used the demonstrations to declare their peaceful involvement in the protest squares but they were moving militarily to expand more and more. They tried to control the Harf Sufyan area in Amran governorate, which they failed to take over in the sixth war in 2010. The Yemeni air force responded and killed a number of Houthis in an air strike on March 12, 2011. On February 20, 2011, the Houthis organized demonstrations in Saada, similar to peaceful demonstrations in Sana'a to demand the regime's departure. After the massacre of Jumat al-Karama (Friday of Dignity) at Change Square in Sana’a on 18 March 2011 and the joining of Major General Ali Mohsen al-Ahmar on March 21 to protest that demand the departure of Saleh, the Houthis became hostile towards the peaceful revolution. The coordination with Saleh resulted in the handover of Saada to the Houthis without confrontations on 29 March 2011 and at the same time al-Qaeda took control of camps in Abyan without fighting. By the end of 2011, the Houthis had expanded their wars out of Saada and extended to the eastern Al-Jawf and western Hajjah resulting in many deaths and injuries and a large displacement in March 2012. On February 2, 2014, the Houthis succeeded in defeating Al al-Ahmar family in Amran and exploded their home. Al al-Ahmar were sheikhs of Hashid tribes for a long time. Sheikh of Hashid Abdullah bin Hussein al-Ahmar, who died in December 2009, was one of the most prominent figures of the regime in Sana'a, and one of the founders of the Islah party that combines tribal, political and ideological groups, including the Muslim Brotherhood. In spite of the fact that the Houthis totally take over Saada, where the Yemeni state was absent, and the appointment of Fares Mana’a, one of the top Yemeni arms dealers, as a governor of Saada their eyes were on the capital Sana'a in conjunction with their war against Salafis in Damaj. Yemen was politically paralyzed after the January 2014 National Dialogue Conference because the Houthis rejected the conference’s outcomes document, along with Ali Abdullah Saleh. Then the alliance between Saleh and the Houthis began to emerge. A large network of "Saleh" military and tribal leaders allowed the Houthis to advance towards Sana'a. The lack of confidence among political parties conflicting over the power, and people's discontent with the post-revolution phase that was erupted by Ali Abdullah Saleh's regime, resulted in a severe fuel and gas crisis that people suffered since March 2014. The Houthis managed to quickly pass through the Yemeni state and tribe from the far north to the capital Sana'a in the following year. In September 2014, the collapse of the Yemeni army's resistance was almost dramatic, as some have described it. The guards of Radio Sana'a, the Cabinet and the Ministries of Health and Information handed over their positions without fighting, and even left the scene (). The Houthis arrived in Sana'a. The Houthis took control of the headquarters of the 6th and 1st Armored Division, the 4th Brigade Command of the Presidential Guard, the Supreme Command of the Armed Forces, and the Moral Guidance Department, which broadcasts the state television programs, where the guards handed over those buildings without fighting. The Iranians announcement that they are ruling four Arab capitals, "Sanaa, Baghdad, Beirut and Damascus,"() had provoked anger among Gulf neighbors. The Houthis opened the skies for Iranian planes, and arms shipments from Tehran to the Houthis in Sanaa as well as the arrival of military experts from Iran and the southern suburb of Lebanon to help the Houthis were reported. They really have become at the center of Yemen. The outbreak of a civil war began more imminent than in the cities of Al-Bayda, Taiz, Marib and Al-Jawf, in addition to Arhab in Sana’a. People of many governorates were disappointed because of the weakness of the state to counter the Houthis. 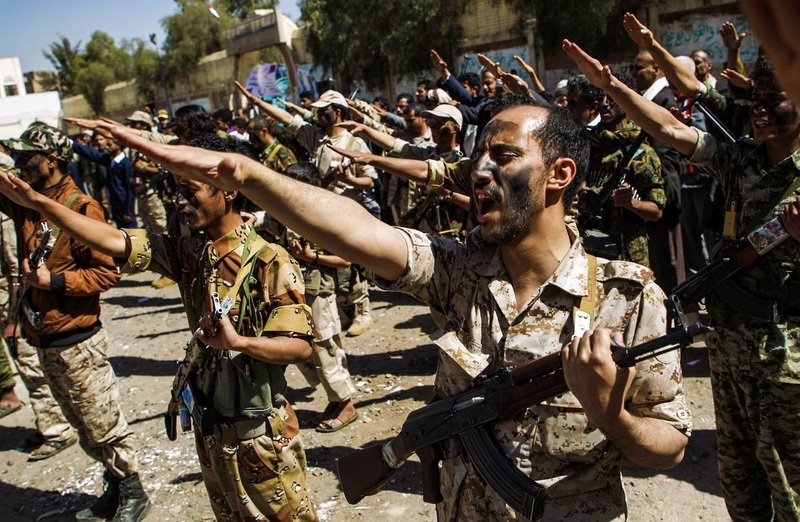 The community began to fear the Houthis who took control of the capital. Ali Abdullah Saleh has been threatening President Hadi and his government who were in Aden at the time that they will be pursued, pointing out that they will have to flee to Djibouti only (). The Houthi militants moved to Aden to hunt down President Hadi, who requested a military intervention from Saudi Arabia to save the country from the Houthis. On 26 March 2015, Saudi Arabia announced the leadership of a coalition of several Gulf and other Arab countries to confront the Houthis in order to restore power to the legitimate president. Twenty five days after the announcement of the Decisive Storm, specifically on April 21, 2015, the command of the operation announced its cessation and the beginning of Operation Restoring Hope, after the Saudi Defense Ministry announced "the removal of all threats to the security of Saudi Arabia and neighboring countries," and after the destruction of heavy weapons, ballistic missiles and the air force held by the Houthi militias and forces loyal to Saleh. But that was only at the level of neutralizing military air force. As for ballistic missiles, the Houthis got more ballistic missiles with a support from Iran. The Houthis and Iranians strengthened their relations more than they were before the Decisive Storm. The Houthis participated in Kuwait peace consultations and previous consultations in Geneva, Switzerland, but the armed group was controlling the decisions of any military moving. They rejected most of proposals made by the world countries and the United Nations. Thus, the war entered decisive turnings. A few days before the announcement of the end of Kuwait's consultations in August 2016, the Houthis and their ally, Saleh, announced the formation of a supreme political council to govern the areas under their control. The council appointed a “rescue government.” The Houthis also allowed to the House of Representatives to resume its sessions with a low quorum. They all are loyal to the former president Ali Saleh. The Houthi-Saleh alliance continued amid quarrels and accusations of treason and complicity until they reached armed clashes by mid-2017 following the transfer of the Central Bank from Sanaa to Aden, which made the funds and supplies of war for the Houthis decrease, in addition to financial and administrative corruption within the de facto authority in Sanaa. Since the beginning of 2017, the Houthis have applied a plan to weaken and dismantle the remaining blocks loyal to former President Ali Abdullah Saleh, and the remaining Republican Guard brigades as well as the popularity of his party, the General People's Congress. On the occasion of the founding of the General People’s Congress on 24 August 2017, Saleh tried to restore some of balances after the Houthi bulldozing of all the institutions that he used to control in the past. But the Houthi bow was the first successive strike that ended with a costly defeat of Ali Abdullah Saleh whom the Houthis killed on December 4, 2017. Houthis after this date entered a critical stage of violence, cycles of conflict and bloodshed. This stage was characterized by a clear absence of any political cover for their movement, which reflected negatively on the military performance of Houthi fighters in the battlefields as the Houthi movement began to lose areas and leaders day after day by the end of 2017. Between the scenario of subjugation and surrender and the scenario of the military defeat, many other scenarios that were open to the Houthis have been lost until recently. Washington, the United Nations and the European countries are trying to pressure the Arab coalition, the Yemeni government and the Houthis to start the dialogue and find political solutions. The Houthi movement seeks one goal, which is to rule the Yemenis by force or to be annihilated without achieving that goal. The follower of this bloody movement finds that its steps are heading to a dead end, to the collapse that the movement has borne its seeds since its inception. "The legitimate position of the Houthi sedition: the state's fight against the rebels is a legitimate right and it is obliged to do so by law and constitution." Ministry of Defense. How did the Houthis control Sana'a without resistance from the army?